How did Matt lose his baloobius? 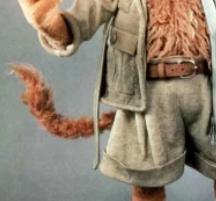 Discussion in 'Fraggle Rock' started by fizzingsoda, Aug 3, 2018.
so we know for certain that matt does not have the tuft on the end of his tail. like that is very gone. we - i, maybe - know why it's gone (with reference to character design and symbolism, you can ask about that! I Love To Explain It), but do we know how he lost it? did it fall off? did it get detached? did it just grow out? I think Sprocket bit it off. Hmm. I definitely never noticed! Good eye. I guess there's no good explanation other than, he probably lost it during some kind of adventure. Maybe plucked by a Gorg. I've always just assumed he's balding. Brio the minstrel doesn't have a baloobius either, and she looks kind of old as well. Do we know if the world's oldest fraggle has one? Hm. I never noticed that. I'd assume it'd be, like @Dodo said, either balding or some kind of accident during exploring, maybe. I've always just assumed he's balding. brio has always been young to me. she implies that she's the newest minstrel (and "new" tends to be around "young" in my head)... convincing john doesnt have his either! i'll look for pictures of the world's oldest!! I always figured it was an old-age thing. Although, I'm on the fence, ( very on the fence ) with calling his tail tuft, the baloobius. I've always thought it was a gland or something in the tail. That's just me though.